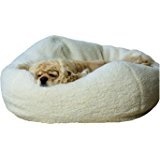 Best Dog Beds Your Spoiled Pooch Will Love Better Than Your Bed! Now You Can Get A Good Night's Sleep Too! Love More Than Your Bed! So You Can Both Get A Good Night's Sleep! The best dog beds are the ones pets head for when it's time for some serious night time sleep. During the day most dogs are just casually snoozing and keeping an eye on you for a potential walk or some fun! Very often they'll be hanging out on a nearby rug, your couch, or even your bed for their day time naps. Pet parents usually have some specific requirements besides price when they are trying to find the best dog beds for their furry friends. First of all, no two dogs are alike when it comes to sleeping habits and positions, they come in all shapes and sizes both big and small, lean or with more fat, their coat may be thick or thin, some have special needs, while others are just style conscious (or their owners are)! So, gather your dogs stats before you begin your search for thebest dog bed hunt so you'll know what to focus when you're ready! And one FYI - while a dog may not take up much space when curled up, some toss and turn in their sleep and many breeds like to sprawl at some point during the night. If you have one of these restless guys, give them a bit more room to allow for this. On this page we've highlighted a number of the best dog beds that cover the majority of preferences and hopefully will make the shopping easier when your pet needs a new bed. Towards the end of this page is a check list for additional help. Whether you're looking for small or large beds or even the extra support of Orthopedic foam, you'll find everything from practical to pawsitively posh...right here. Canine sleeping quarters have come a long way in recent years and are now making striking statements in modern-day furball dreamland. You can now pamper your pet with cushy comfort in a variety of fabrics and styles, from funky to fabulous. With the many unique styles now available in both contemporary and classic designs, it's easy to find something that will blend right in with your other family furniture, if that is your goal. Time was when a puppy just had a rug by the door or if lucky, could hop onto the family couch. Now our furry friends can have their very own designer dog sofa or lounge! And why not? When you consider that our dogs spend a good deal of their day snoozing, a good quality bed, dog sofa or pillow to take a few winks, has a lot of merit. It may also lessen his interest in curling up on your furniture! If you want to give your dog the ultimate sleep therapy, then luxury beds are the way to go. Why not have something stylish that can be admired and perhaps blend in nicely with your other decor? Plus, the best dog beds aren't necessarily expensive...so don't despair, just select a bed for comfort and any special needs and your dog will still feel pampered. Depending on your pets particular needs, here are some other factors that may have an influence on your choice of the available best dog beds when you are looking into getting one for your pet. A pet with joint problems... would definitely be more comfortable with a thickly padded orthopedic bed providing the best support to reduce pressure. An older pet that might be bothered with occasional aches and pains, would certainly bark his approval for a heated pet bed as would a dog living in a colder climate. A pet recovering from an illness or surgery would most likely welcome and benefit from a specialized bed. The orthopedic bed recommended above is also very suitable for a dog in this type of situation. If you have one of the larger dog breeds, the best dog beds to suit their needs would be ones that are extra thick with more adequate cushioning to support their weight. Ideal beds for their naps will be ones that come with extra thick medical grade foam. But even big dogs can be fashion conscious too and appreciate a modern designer look, or even a funky looking dog couch! And let's not forget the needs of an allergy-prone dog that is sure to appreciate organic dog beds made with eco friendly materials like hemp, natural unbleached cotton, buckwheat hulls and recycled materials for filling. For your own convenience, washable components are nice additional features to look for, making it so much easier to keep everything sanitary and fresh as a daisy. Look for a good quality bed, one that is waterproof and has components that are washable. Waterproof dog beds are especially suitable for incontinent pets. Choose fabrics that hold up well under repeated laundering. This will keep the bed fresh smelling and free of pests. Check out the composition and material used for the filling. Memory foam or Natural fibers offer superior comfort. Choose one that fits your dog's needs. If you want a more decorative look, check out the different designer beds. Some dogs like the security of a bed with bolsters or walls and small dogs will stay warmer in this style of dog bed also. Other dogs just like to rest their head on the shoulder panels. Think about having a separate washable bed for your car so that doggie odors don't build up in your vehicle. Purchasing more than one cover is useful so that you always have a clean one at the ready. Think "Thick" foam dog beds for older, arthritic dogs, or big dogs. If your dog has thin skin or a light coat consider fabrics that won't irritate. Fleecy, furry, or natural cotton would be good choices. Don't forget heated beds for pets that sleep in colder areas. If parasites are a problem, cedar filled dog beds discourage these pests and also have a deodorizing effect. If you have allergy problems, stay away from products containing substances or fibers that may trigger your allergies. Leather would always be a good easy-care choice. No matter what the conditions were that first brought man and dog together, the evidence is clear that dogs have become beloved and loyal friends over the years. When you consider your dog's comfort and well-being, he's worth a good bed don't you think!